Premium weather-resistant cargo carrier bag from Direct Aftermarket provides convenient additional hauling capacity to your vehicle. Carrier is great for hauling many different types of cargo such as luggage, equipment, tools, or any other items. This material is constructed of weather resistant Oxford style fabric, treated with a PE coating, to keep out rain, dirt, and other elements. This cargo bag keeps your items dry with a zipper closure, hook and loop straps, and 8 integrated click clasps. These clasp straps are double stitched and can be used to help tie down the cargo bag. The cargo bag measures 58 in. x 20 in. x 19.5 in. 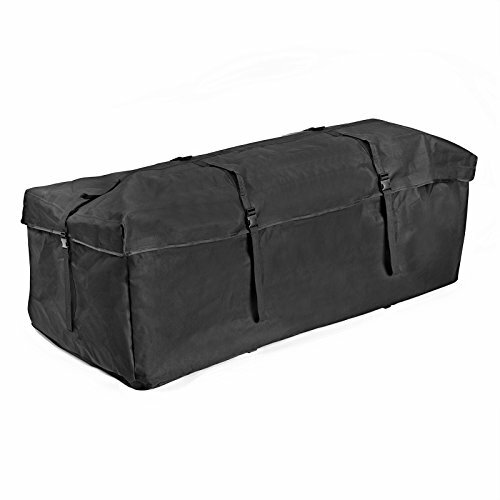 (over 13 cubic feet) which makes it ideal to use on most hitch cargo carriers.